As we get closer to the start of ticket sales, I wanted to post a quick note about the ordering process and claiming your tickets. 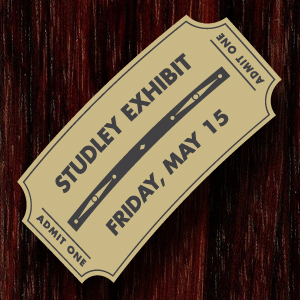 Tickets sales for the H. O. Studley Tool Chest and Workbench Exhibit will start at 12:01am EDT on Sunday, June 1. At that time the TICKETS link in the menu bar will become a live store, and it will have three items — each representing a day of the event (Friday, May 15; Saturday, May 16; and Sunday, May 17). When you click on a particular day you will be presented with a drop down menu from which you will choose a session time. Each session is 50 minutes long, and starts on the hour from 10:00am to 5:00pm. Once you select a specific session, you will see how many tickets are still available for that session and a quantity box to select the number of tickets you wish to purchase. Each session will only have 50 tickets available, so we recommend that groups wanting to attend a session together have one person buy the tickets for the entire group. That’s the simplest way to ensure that you all get tickets for the same session. After selecting your session and quantity, you will click the button to add them to your cart — then a View Cart button will appear. Click that button and then Proceed to Checkout (assuming you have added all the tickets you wish to purchase). Once you’re on the Checkout page you will register like any other on-line purchase. Simply fill in the fields (red asterisks signify mandatory information) for your name, address, email and phone number. ***We will not be selling, renting, or sharing this information with anyone. We just need to be 100% confident we can contact you. *** Then after double-checking the details of your purchase you will click the button to pay on PayPal ( Note — you will be able to pay with a credit card even if you don’t have a PayPal account), and it will take you to the payment screen where you will follow their prompts to remit payment. Upon completion, you will receive an email confirming your order. While the order is instantly completed and the email is automated, it still may take a little time for it to show up depending on the amount of traffic we are experiencing. Also, to answer a question we’ve already received: YES! The ticket store is also accessible via a mobile device. You will not receive your tickets in the mail. Instead tickets will be picked up the day of the event. For this reason, we ask that everyone arrive at least 15 minutes before their session to assure enough time to get tickets sorted and make sure everyone is there. Tickets will be held under the name of the person who purchased them. That person must bring a photo ID to claim the tickets, and then be responsible for dispensing tickets to those in their group. We hope this gives you the necessary information to feel at ease about your upcoming purchase and the steps of doing so.